Celebrate the bounty of spring with SFC at our annual fundraiser on the lush grounds of historic Barr Mansion on May 9. Delight your guests with food by over 25 leading Central Texas chefs dedicated to sourcing locally. A "sip and stroll" format, Farm to Plate also features handmade cocktails, biodynamic wines and local microbrews. For the FIRST year ever, Farm to Plate will feature our annual Sustainable Food Changemakers Award ceremony. Tom and Lynn Meredith and their son Will Meredith are our inaugural recipients of this honor. Please join us in sharing this evening with the Meredith Family as we acknowledge them for their leadership, pioneerism and support in strengthening our local food system. Don't miss out on buying a table of ten or an individual ticket to the fundraiser of the season benefiting SFC! Click here to purchase! Have you seen SFC's new column in the Austin American-Statesman? Keep an eye out for our Grow.Share.Prepare article the second Saturday of every month, in the Life & Arts – Gardening section. Grow Local & The Happy Kitchen® team up to provide seasonal edible gardening instructions coupled with a delicious recipe. This month, learn all about growing root vegetables, and enjoy a tasty recipe for roasting them to perfection. Act fast if you'd like to grow your own root veggies this spring, as we're quickly approaching our warm-weather crops season - or you can opt to pick some up at any of the SFC Farmers' Markets! Where Did Our East Market Move? Click here to find out from our happy vendors and customers! Without its 40+ Facilitators, The Happy Kitchen/La Cocina Alegre® would not be able to operate. The program is built upon the peer to peer model, training community members to become Facilitators. Informative (and fun!) six-week classes and workshops are then delivered to communities in need. One such Facilitator is FayeLynn, who has been facilitating since 2008. "What made you want to become a Facilitator?" Find out here! 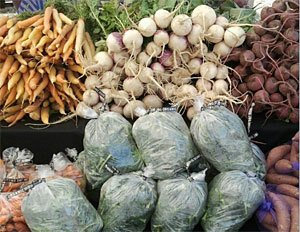 Two important local food bills were heard before the Texas House Public Health Committee at the Capitol on Wednesday, February 27. Over 100 Texans attended the hearing and registered in support of HB 46, which would allow licensed dairy farmers to sell raw milk at farmers’ markets, and HB 910, which would cap the health permit fees that could be imposed on farmers and farmers’ market vendors. Click here to read the Farm and Ranch Freedom Alliance press release about these important bills. 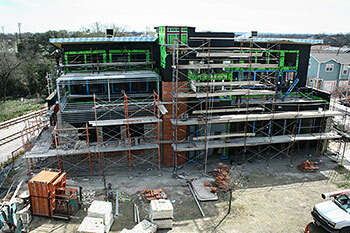 Please visit our campaign page to view our construction updates. You Did It Austin: Nearly $2.8 Million in 24 Hours! Not only is Austin one of our country's coolest cities, it's one of the most generous cities as well! This week marked Amplify Austin's first annual day of giving, and Austin shattered the $1 million goal, raising nearly $2.8 million for area non-profits! Donations to the SFC totaled almost $6,000, and we want to offer our sincerest thanks to all of our donors and our community who support us every day. We could not continue doing what we do without you! Need to fill your fridge or catch a quick lunch? Shop at Wheatsville! Every Wednesday in March, 1% of store sales will be given to SFC! Join us for Swoop Social Hour the first Tuesday of every month from 6-7pm starting April 2nd at Swoop House, 3012 Gonzales St! A BYOB happy hour with complimentary hors d’oeuvres from 2 Dine 4 Fine Catering. $5 suggested donation benefiting SFC. The National Farm to School Network is excited to announce that the 7th National Farm to Cafeteria Conference will be April 15-18, 2014 in Austin, TX! Information regarding the conference program, registration, and more will be posted on farmtocafeteriaconference.org. Explore the website to learn more about last year's great speakers, workshops and events. Mecca Gym and Spa is raising funds to support SFC's mission each month of 2013! In March Mecca is donating 10% of all smoothies sold. Funky Chicken Coop Tour is March 30th! Find out firsthand what it takes to keep feathered friends while fostering a closed-loop local food system. Details here! 5:30pm kick off cocktail hour with a multi-course dinner featuring the chefs of Sway, Lenoir, La Condesa & more! Buy tickets now!